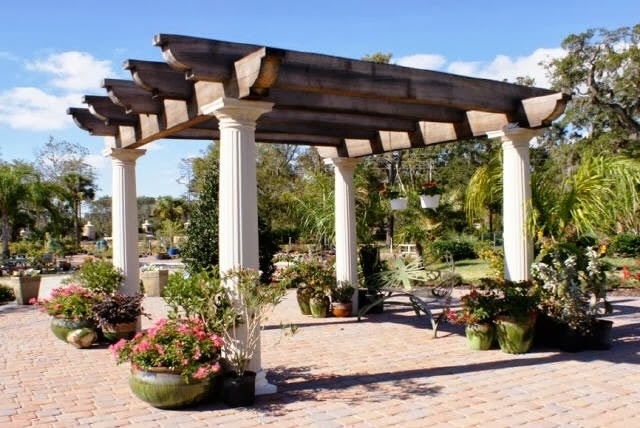 Pergolas have always been a staple garden architectural structure in the most charming gardens we’ve seen. But these completed pergola projects we’ve accomplished in the past tell only one thing: that pergolas can also lend a charming look to the rest of your outdoor needs. 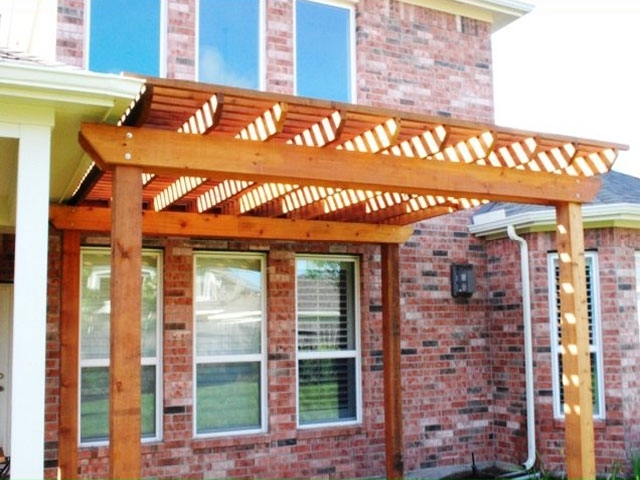 Read on and find out how the pergola can revolutionize the outdoor look in 5 different ways. Paying homage to its roots, this pergola installation right in the middle of a garden perfectly exemplifies the aesthetic value a pergola adds to your garden pathway. Giving shade and posing as a view deck from which one can better appreciate the beauty of your outdoors, a pergola certainly adds a rustic and charming vibe to your outdoors. Instead of the usual welcome arches adornment, how about a pergola which frames your doorway nicely while still giving the rest of your home’s façade enough room to shine. 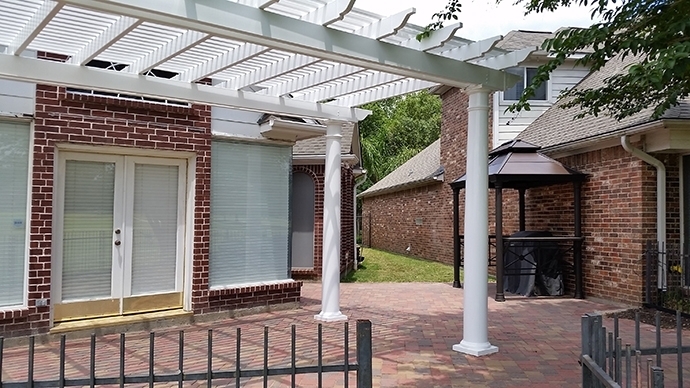 Just like this home which installed a white pergola to seamlessly fit with its white-lined brick façade, the pergola gives a new architectural marvel. This patio got a refurbished roof in the form of a round pergola. With a clear roof atop the pergola, this home will surely enjoy a good night’s chat under the starlit sky all-year round. Giving shade while still imbibing the atmosphere of a sunroom without the walls. Who said pergolas can only be installed in gardens? As evidenced by the previous pergola installation, a pergola even with its lattices can still make for a protective patio cover. A pergola style of roofing gives you ample sunshine or moonlight to work with in your outdoor kitchen while also adding an interesting and more importantly functional architectural design. Just because it’s a side roof doesn’t mean it has to be boring. 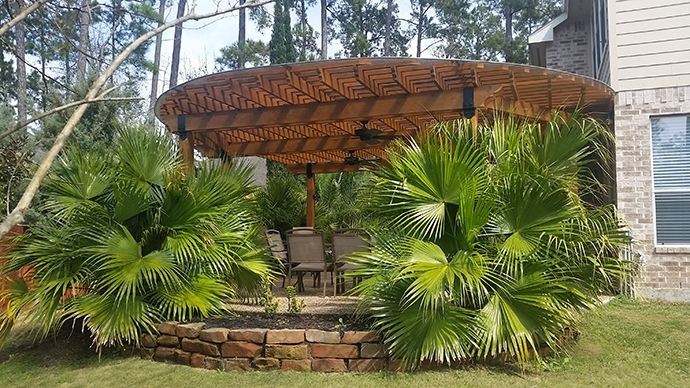 Instead of simply extending your roof line or in most cases, when a side roof is necessary, why not consider a shorter version of a pergola to add pizzazz to your outdoors. 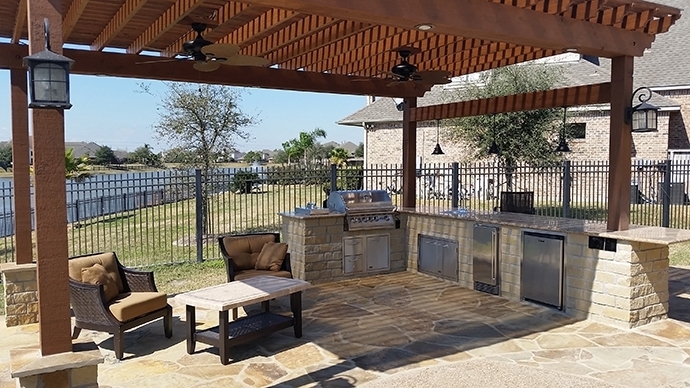 Just like what this home did, they matched their compact outdoor kitchen with a side pergola which fits snugly.